It’s time to don your tuxedo, mix yourself a martini-based cocktail and and then quickly check your balance to make sure you have enough cash in hand to play this VIP version of the ultimate casino game. It’s called Blackjack VIP and it’s developed by Net Entertainment to complement similar versions such as Blackjack Single Deck. This is definitely one for the high rollers out there with a minimum stake per hand of £50 up to a maximum of £2500. You can play up to three hands per deal which obviously means a betting range of £150 to £7500. Blackjack players will be familiar with the format here, especially those with the deep pockets, but we’ll run through the rules briefly for the uninitiated. The aim is to make a hand of 21 or lower which also beats the dealer; the dealer must stand on 17 and draw at 16 or lower. Once this stage is compete the dealer reveals his hand and plays it out according to the dealer’s rules. If he busts (exceeds 21) or fails to reach your total then you are a winner. A standard win will pay at evens and a Blackjack (Ace plus 10) pays at 3/2. 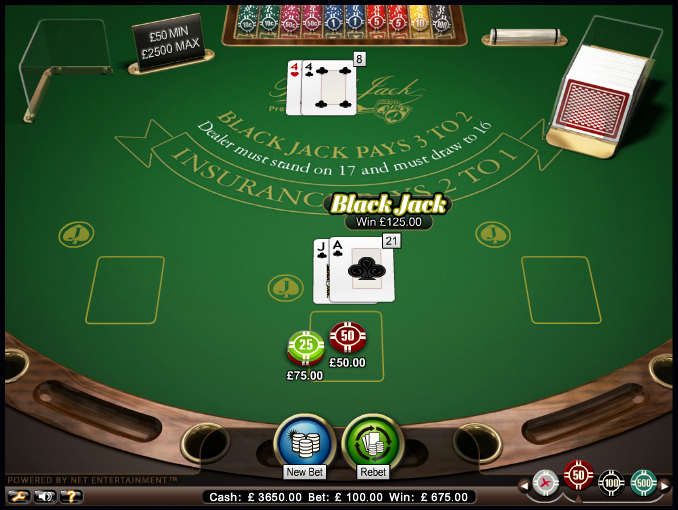 This is another version of Net Entertainment’s standard Blackjack software and very good it is too but beware – it’s for high rollers only. Use our strategy guide to ensure you get the best RTP of 99.53%.